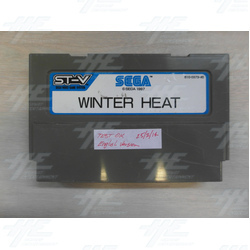 Winter Heat is a sports game from Sega where you participate in various Winter Olympic events including ski jumping, speed skiing, and downhill skiing. Players must beat the qualifying time to advance to the next event. The game includes 3D graphics and runs on the ST-V system. <b>Game Play :</b> You play various Olympic type events, trying to make a minimum qualifying time to go onto the next competition. An important factor in several levels, like Track & Field, is mashing down on a single button very fast in order to pick up speed. Winter Heat is a sports game from Sega where you participate in various Winter Olympic events including ski jumping, speed skiing, and downhill skiing. Players must beat the qualifying time to advance to the next event. The game includes 3D graphics and runs on the ST-V system. Game Play : You play various Olympic type events, trying to make a minimum qualifying time to go onto the next competition. An important factor in several levels, like Track & Field, is mashing down on a single button very fast in order to pick up speed.